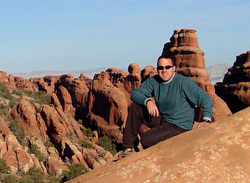 Kevin is a technically skilled, practical landscape architect with a talent for collaboration and project management. Since 1998, Kevin has practiced in both public and private sectors, bringing a pragmatic approach to problem solving and fostering consensus. His technical skills ensure each project meets the client's vision, and that the project endures for future generations. Kevin's professional experience at traditional landscape architecture and planning firms is strengthened by over seven years of experience he gained at Boulder County Parks & Open Space. That governmental experience provides Kevin with an intimate understanding of the procedural requirements of our agency clients, plus an appreciation for the value of citizen participation in the planning process. Kevin's interest in restoration ecology is evident in the environmentally sensitive solutions he provides to our clients' projects of all types. He volunteers regularly with Wildlands Restoration Volunteers and the Friends of St. Vrain State Park, and was awarded Technical Advisor of the Year in 2010 by WRV.